I just got back from a launch event hosted by our SolidWorks VAR (Value Added Reseller), GoEngineer. 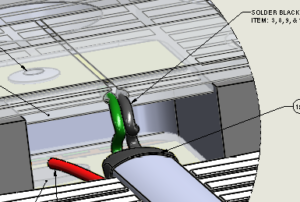 One thing I like about SolidWorks and GoEngineer is they make these things fun. From SolidWorks World to onsite 3D Printer kid camps to a launch day (with a movie thrown in), they find a way to celebrate and electrify the work we do. It’s a good attitude adjustment for the tedious monotony mentality that occasionally starts to creep in during the daily grind. First- a quick comment- my expectations were to see something that would make me faster on core SolidWorks. I’m a firm believer that being quick on fundamentals is really the key to overall productivity. However, I wasn’t sure what that could be. Right now I think the customization (along with mouse gestures, the “s” key and the spacebar menu access) is pretty comprehensive (for more info on these type of “speed-moves”, check go to: Top-10-Speed-Moves). From the lack of changes I see on repetitive common modelling methods from SolidWorks, I believe they are realizing that they’ve hit the spot of diminishing returns as well. As a result, I think they are investing more effort in specialty-type tools like simulation, electrical and sheet metal. What does that mean to you and I? Well- it’s kinda like Eddie (the character in “Venom”- which is the movie we got to see at the launch event, and I’ve been really wanting to go to but my wife wasn’t interested and I thought I’d have to see it when it came out on video). Sharing his body with an alien wasn’t exactly what he was looking for. At the launch event, I wasn’t really looking for some changes on low-usage specialty features. BUT if Eddie can make it work, I think I can figure out how I can make this work. Quite frankly, I think it might be exactly what I need (I’ll explain that later). Granted- this isn’t a great or accurate way to measure change, but it’s not a horrible indicator of where the Dassault development love (ie time, energy and money) is going. I haven’t looked back to see if this is a trend, but it appears to me that SolidWorks is focusing more on specialty tools- which makes sense. There are a few repercussions of this. The first is that standard SolidWork skills are turning into more of an expected base of knowledge. The other is that SolidWorks has become a “transfer site” for specialized work, documentation, collaboration and communication. So if you are making an alarm, the electrical engineer can work on the PCB board while the designer works on the housing surface while manufacturing checks tolerances. Given that- it is very difficult to host detailed/in-depth release parties, because the scope of all the changes is so large. #1- Measure tool now available full-time=> this is one of those small things that has always annoyed me to the point where the measure tool was on my mouse gestures so I could quickly check if changes I made resulted in what I wanted. #2- Saving an assembly as a part=> I wonder why this didn’t happen sooner. Since a part can already handle multi-bodies, this is just a logical extension of the existing functionality. 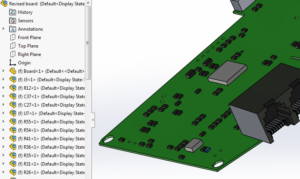 I see this really being a benefit to integrate PCB design (and saving a board as a single and much more manageable component) while a product is under early to mid- development. #3- SolidWorks Electrical & PCB=> I’m currently working at a company that has a separate software for handling the PCB design. The new tools in electrical and PCB are giving me the ammo to talk to my co-workers about reducing it to one. #4- Animation output=> If a picture is worth a thousand words, then a good animation has to be worth at least 100 thousand. I’ve had problems in the past with getting a clip to play correctly. It looks like this might be a solution for those issues. #5- Deleting holes from surfaces=> for anyone who has had to do this (usually by cutting out a rectangular shape, and then creating a boundary surface, and then stitching the surfaces together), this could be an incredible time saving device. #6- Simulation=> so look- I’ve PRIMARILY used simulation as eye-candy for management. When I’m really using it effectively for engineering purposes, I’m bouncing between it and real models (testing my simulations and then anticipating what changes will do). Quite frankly though, my proficiency & ability in Simulation hasn’t kept up with the advancements that have occurred. I need to get better, and some of the changes will make life easier, and some will expand the capabilities. #7- PDM=> with a trend of specialty tools becoming a new standard, it bears to reason that projects will get increasingly more complex and will require a larger base of people working on them. The company I’m doing work for now is the 3rd that is going to a formal PDM system. Why? It creates discipline, reliability and consistency. And it only takes one disgruntled cuckoo to wipe out months of work on an unprotected system. The changes shown will make it easier to work within PDM. 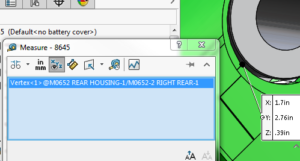 I don’t like having to use PDM, but SolidWorks is making it less unpleasant. Why did I emphasize “MY” in the list of favorites? Because that’s what’s going to fit my personal development plan and push/motivate me to try and learn new things. As you explore and figure out what you want to add to your toolbox, I would suggest that you take a look at 2 things. 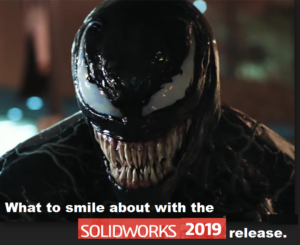 Next: look at the different changes that SolidWorks is doing. Ride the wave that they are creating. 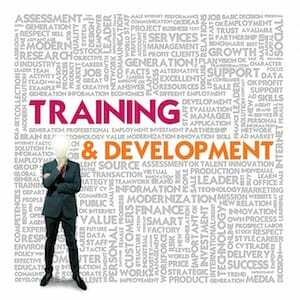 This is a good time to start gearing up for those New Year resolutions and getting you manager to budget training and/or new software (like SW add-ons). Full disclosure: I haven’t tried SW 2019 as a beta tester. I haven’t been a beta tester since I wrecked a project due to backward-capability issues. This article is based completely on what I’ve seen, heard and read either at the Launch event or from the release guide. Anyway, thanks for the changes, the free movie/popcorn and a shot of motivation. 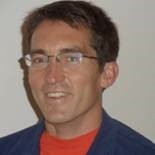 Jim Lucas is currently a design engineer at a company that focuses on disposable medical products and alarms. He can be reached at Jim.Lucas@i-elf.com.